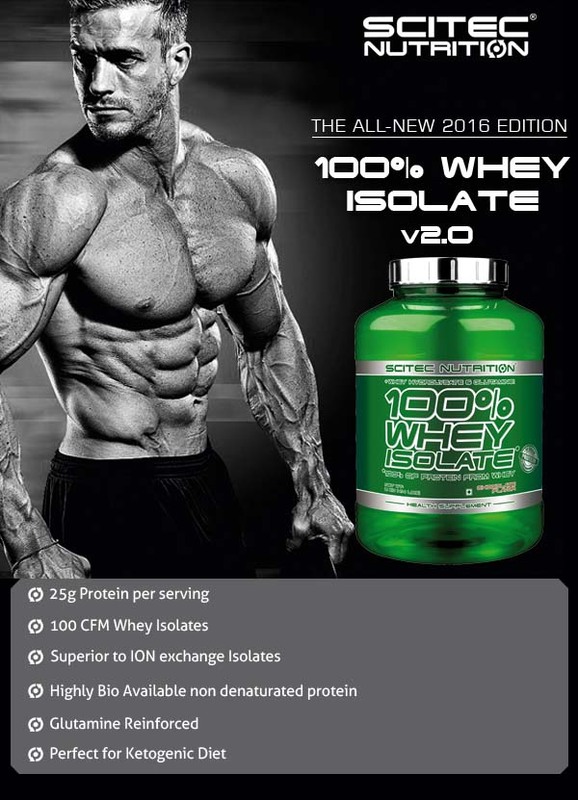 Scitec Nutrition launches the all-new 2016 Edition of its premium quality Whey Isolate protein. Scitec Nutrition 100% Whey Isolate v2.0 is now with 25g protein per serving from 100% CFM Whey Isolates and is further enriched with glutamine. 25g of only CFM Whey Isolates per serving: 100% Highly bioavailable non-denatured whey protein. Over 83% protein per serving with Zero-lactose, Zero sugar, and Zero fat: Ideal for low-carb or ketogenic diets. Superior to Ion Exchange Isolates: Unlike the ion exchange technology, the CFM technology delivers the major bioactive whey protein fractions in an intact form. Fortified with Whey Hydrolysates: Superior, pre-digested Whey Hydrolysates are quickly absorbed and transported to the muscles for utilization. Glutamine Reinforced: Glutamine is a free-form amino acid that is found in a high concentration in the amino acid pool and provides an anti-catabolic support. Suitable adjunct to a ketogenic diet. · Protein Requirement for a sedentary individual is 0.8-1g/kg body weight. However, for an exercising individual, the requirement increases upto 1.5-2g/kg body weight depending on activity levels. · Therefore, depending on your daily protein requirement and intake through diet, you can increase the number of servings to be taken throughout the day. · For e.g. : if you have 120g as your daily protein requirement and you are able to consume 60g of protein through your diet, then the rest of the protein deficit can be fulfilled by consuming 2-3 servings of protein supplement. · Scitec Nutrition 100% Whey Isolate is an instantized formula and can be easily blended in a shaker cup or a glass. · Mix 1 serving (30g) in 350 ml of water. Shake vigorously for 30secs for smoothest consistency. · You can increase or decrease the quantity of water based on how thick or thin you want your protein shake to be. · For a better shake use room temperature water. The colder the water the more the protein coagulates and makes a thicker shake. · Also to avoid powder getting stuck to the shaker, add water first and then add protein to water. · The ideal times to consume Scitec Nutrition 100% Whey Isolate are, first thing in the morning and post-workout, so as to stop catabolism (breakdown of muscle) and kick start anabolism (muscle synthesis) respectively. 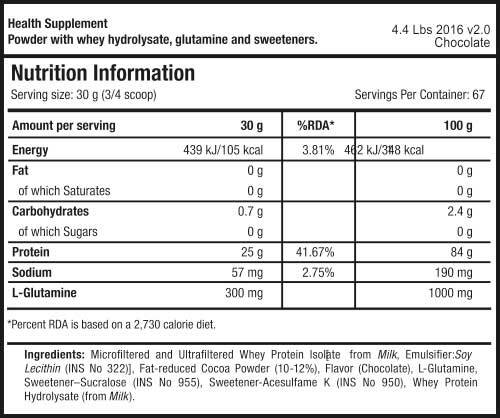 · Apart from the above mentioned times, Scitec Nutrition 100% Whey Isolate can also be consumed with/in-between meals to meet up daily protein requirement. Q.1 What is Scitec Nutrition 100% Whey Isolate? Scitec Nutrition 100% Whey Isolate is an excellent quality protein from whey isolate and fortified with even faster absorbing whey hydrolysate and L- glutamine. Whey Isolates are known to provide faster, better absorption and utilization of amino acids. Packed with best quality whey, Scitec Nutrition 100% Whey Isolate provides 25g protein per serving (30gms) for rapid delivery of amino acids to initiate muscle protein synthesis and quick recovery. Whey Protein Isolate has a higher percentage of proteins which rounds to almost 80-90%. Higher concentration of protein is the result of the processing it undergoes i.e. either Cross flow Micro-filtration and Ion- Exchange. These processes help to separate protein from lactose, fats, ash and minerals. Whey Isolate has minimum amount of lactose, fats, ash and minerals in comparison to whey Protein Concentrates Whey Protein Isolate is a fast acting protein and the body digests it within 30 minutes of consumption, the property to digest fast helps to repair damaged muscle tissue and aids in faster recovery Whey Isolates have much lower amount of lactose than Whey concentrates, thus a great choice for lactose sensitive individuals. Q.4 Is Scitec Nutrition 100% Whey Isolate suitable for consumption for vegetarians? Q.5 What is the ideal time to consume Scitec Nutrition 100% Whey Isolate? The ideal times to consume Scitec Nutrition 100% Whey Isolate are, first thing in the morning and post-workout, so as to stop catabolism (breakdown of muscle) and kick start anabolism (muscle synthesis) respectively. Apart from the above mentioned times Scitec Nutrition 100% Whey Isolate can also be consumed with/in-between meals to meet up daily protein requirement. Q.6 If Scitec Nutrition 100% Whey Isolate is a protein derived from milk, why cant I meet my protein requirements from diet alone? Q.7 Since Scitec Nutrition 100% Whey Isolate is protein powder; do I still need it if I eat chicken, fish on a daily basis? Q.8 Will Scitec Nutrition 100% Whey Isolate cause weight gain? Q.9 Should I consume Scitec Nutrition 100% Whey Isolate in Milk or water? It should not be mixed with milk, as there is no point in increasing the lactose load by having in milk.